In the heart of Athens, the Acropolis sits on top of a hill. Spread out on the top of that hill are the remnants of centuries gone by and so much that was the beginnings of western civilization. 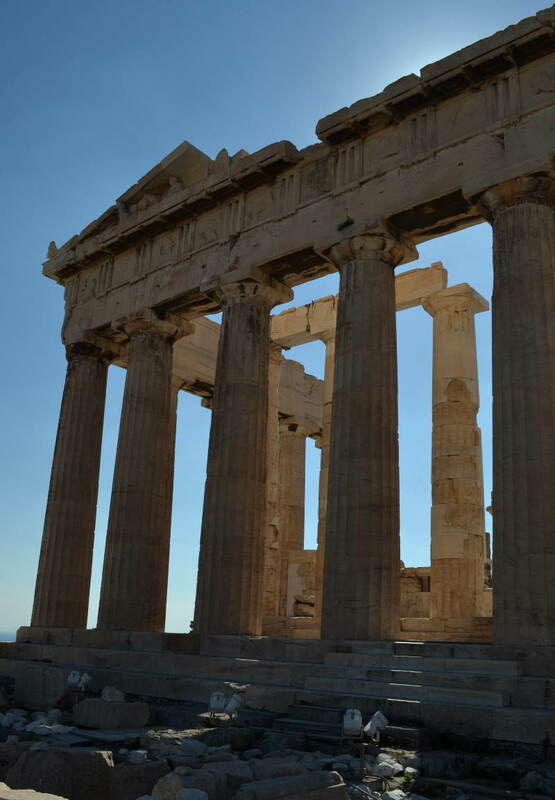 There, at the heart of the Acropolis, is the Parthenon–a temple for the goddess Athena. 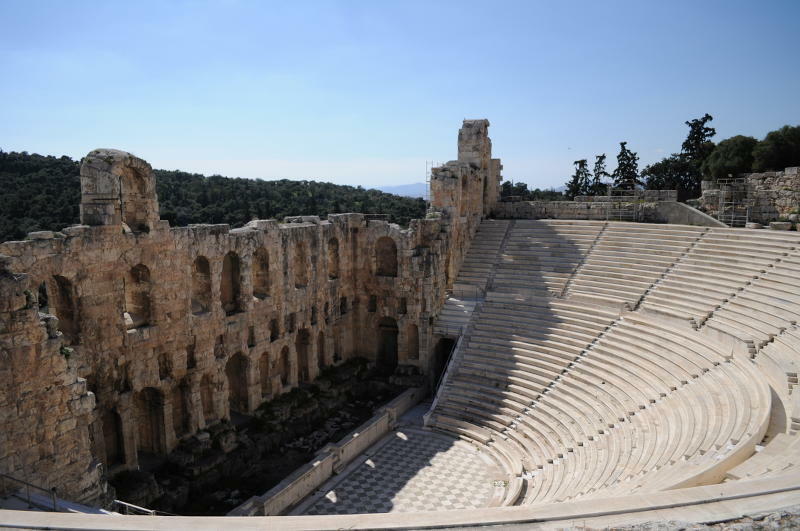 This is the Odeon or the Theater of Herodes Atticus. You’ll go by it on your way to the top of the Acropolis. Situated on the southwest side of the hill, this was an important cultural and religious area for the city of Athens and even the country of Greece as a whole. This theater has and is undergoing reconstruction. Concerts and festivals like the Athens Festival are still held in this theater where the audience looks out over the capital city. So, if you ever want to go to a modern-day music festival in an 1,800+ year old theater, now you found a spot. These marbles are old. 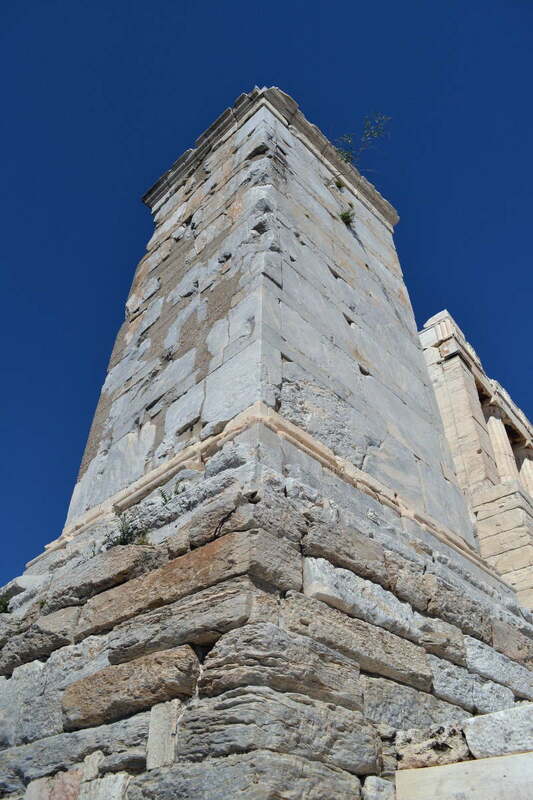 This stone structure was the base of a monument the Athenians built to honor General Marcus Vipsanius Agrippa at least 2,025 years ago. In addition to being the son-in-law of Roman Emperor Octavian Augustus, he was a benefactor to the city of Athens. He must have been one of the good guys for the Athenians to place his statue with horses and chariots atop this stone base. The rocks and structure here date further back. Originally, this base was erected in the first half of the second century B.C. for another king from another era. 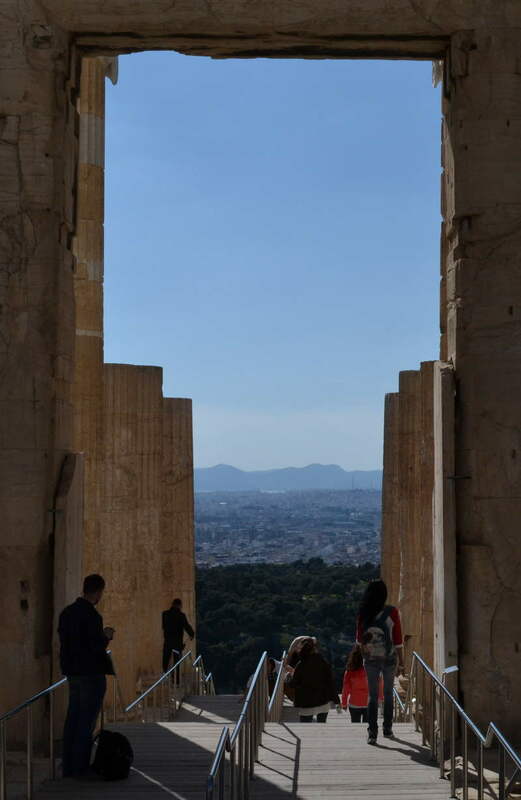 In the middle of it all–the Parthenon. Construction here began more than 2,500 years ago. Restoration is ongoing today. 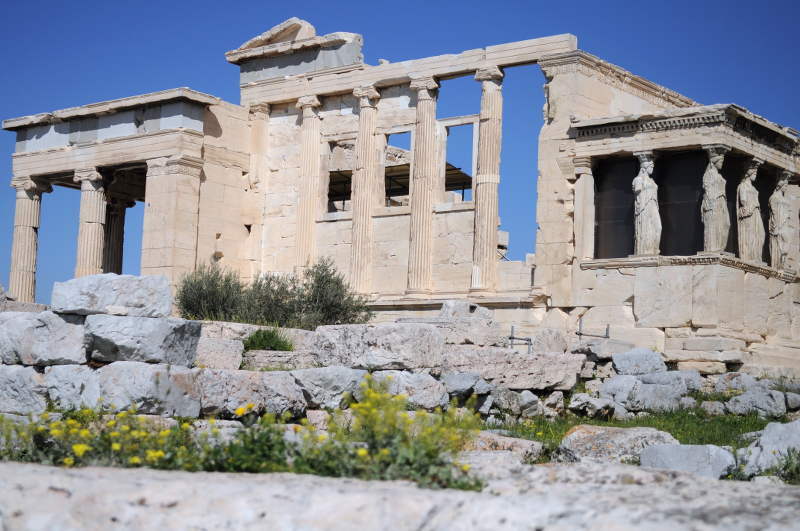 The Parthenon was dedicated to Athena, the goddess of wisdom, civilization, and so much more. Over the years, or centuries, Athena’s distinct characteristics morphed with changing cultural values. Regardless of the values most treasured at the time, she and the Parthenon were at the center of society. The Erechtheum is another temple honoring Athena. It is noted for its quality of architecture and especially for the ladies supporting a corner of the building. 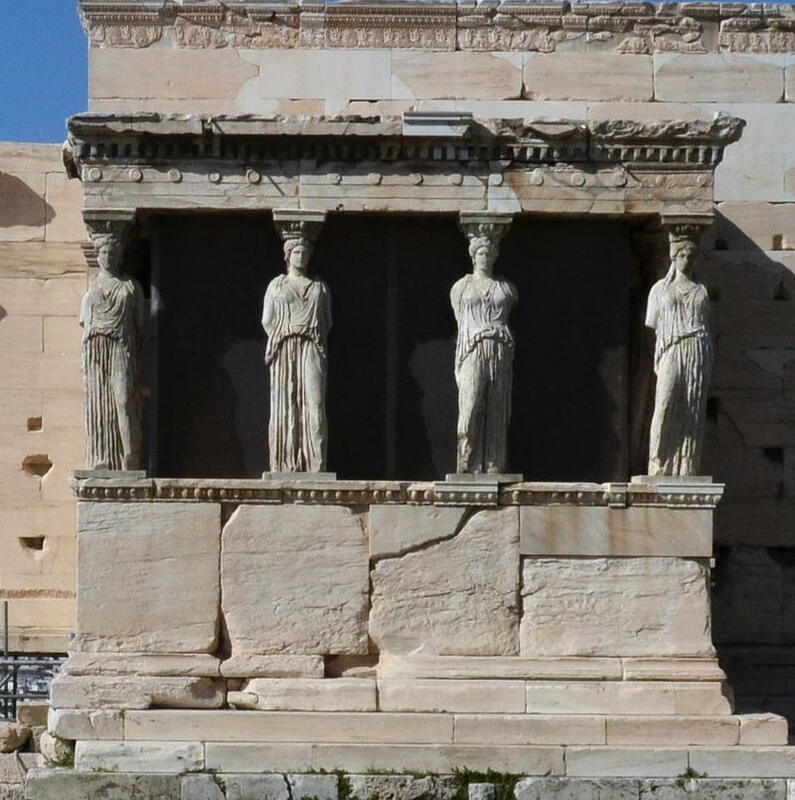 The famous Caryatid terrace or Porch of the Maidens is on a small corner of the Erechtheum Temple. Originally there were six caryatid pillars until a British dude, Lord Elgin, took one back for show and tell in the early 1800’s. Another was smashed when similar plans went awry. Today, the lady that made her way to the UK is on display there in the British Museum while the other remaining ladies remain in Greece in the new Acropolis Museum. The ladies pictured here are replicas. Propylaia was a building at the entrance that was built to impress people as they entered the Acropolis. Now a natural exit for the tour, it is impressive in scope and to frame a view of the expansive city below. It appears construction on this project wasn’t ever finished. More columns among all the historic structures seems appropriate and complete enough. 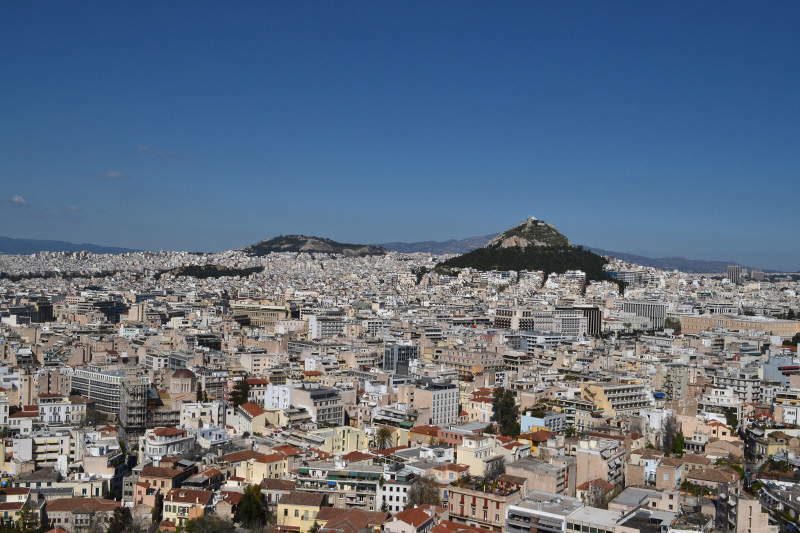 Athens expands below the Acropolis. Here is one view looking out from above. 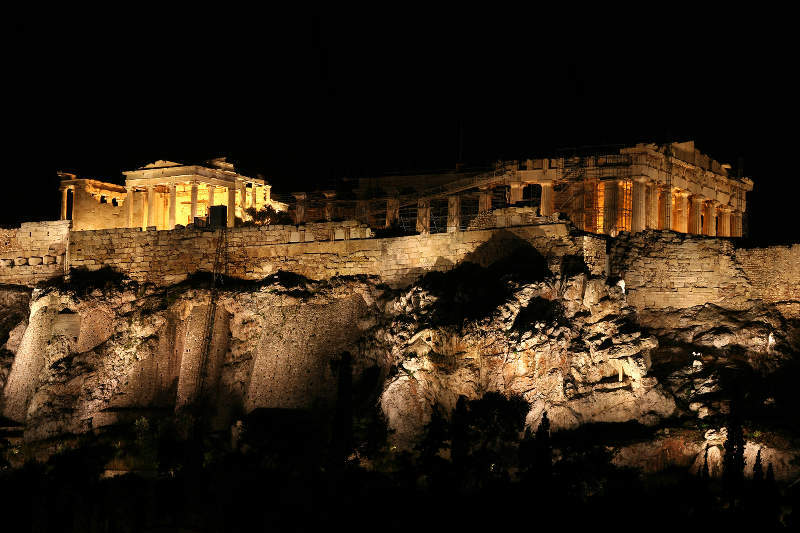 The Acropolis at night is a landmark in the city and a symbol of history and western civilization. I’m jealous. I’ve always wanted to see Parthenon. The Parthenon and all of the Acropolis is a must see Mike. I highly recommend you plan to do this in the future. That looks amazing, love the way they build the parthenon. Great pictures! May I ask which camera did you use? Thanks Wesley. We used 3 different Nikon cameras for this piece.